If you're just starting out wanting to sell your wire jewelry or other handmade jewelry, then it's an exciting time for you. I can also be a bit confusing about how to know where you should start. You have a number of options that can only serve to add to the confusion. 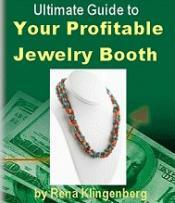 Do you want to wholesale your jewelry? Do you understand how that works? Understand what "keystone" means? Generally speaking, I'd suggest that you learn as much as you can about wholesaling before you venture into that marketplace. I started to do an in depth review on this book but stopped half way thru. This is probably one of the most comprehensive books I've ever seen. Truly. It is so complete that if you're thinking of starting to sell your work, this is a volume absolutely worth the expenditure.